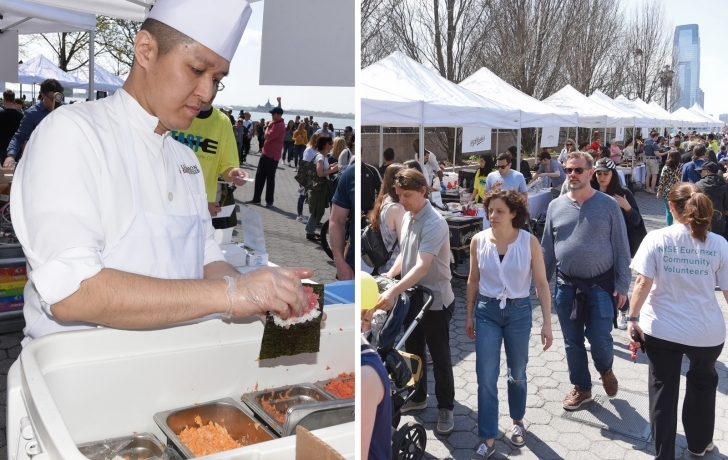 The sun shined brightly and the hungry crowds gathered eagerly Saturday afternoon for PS 89’s fourth annual Taste of Battery Park City. From Parm’s chicken capers sliders and P.J. Clarke’s lobster rolls to mini cupcakes from Sprinkles, there were tastes for everyone from among the 19 participating restaurants. And from martial arts to robot making, the Kids Zone hummed with activities. Kastoun and Henniaux, who took over from former chairs Talene Kelly and Rene Finch, are both from France, and the two noted how smoothly they worked together. “We don’t necessarily like to do the same things so in the end it was very easy,” Kastoun said. Preparations for the big school fundraiser began in November, they said, And as the hubbub of activity swirled around them on Saturday, they praised the parent volunteers who helped it all come together.